The presidents of Ghana, Nigeria and Senegal are visiting Burkina Faso to press the military for a speedy handover of power to a civilian ruler. The African Union (AU) says the army acted unconstitutionally when it took over after President Blaise Compaore was forced to resign on Friday. The AU on Monday gave the army a two-week deadline. Interim leader Lt Col Isaac Zida has promised to cede power. Mr Compaore quit after mass protests at his bid to extend his 27-year rule. Col Zida met Senegalese President Macky Sall, Goodluck Jonathan of Nigeria and Ghana's John Mahama at the airport in the capital Ouagadougou. A statement from President Jonathan's office said the three-man delegation representing West African regional body Ecowas aimed to "facilitate the rapid resolution of the current political crisis in Burkina Faso". They will hold a series of meetings to press for the quick handover, following a threat by the AU to impose sanctions if the military did not act within two weeks. The BBC's Emmanuel Igunza in the Ethiopian capital Addis Ababa says the sanctions could include suspension of Burkina Faso's AU membership and a travel ban on military officials. After meetings with opposition leaders and activists on Tuesday, Col Zida was quoted as saying that he would comply with the demand. "If everyone agrees, there is no reason that the transition shouldn't be done within two weeks," he said, according to union leader Joseph Tiendrebeogo, the AFP news agency reports. Opposition leaders have not entirely ruled out a role for the military in the transition. Col Zida was previously second in command of the presidential guard. Amid the protests, Mr Compaore fled to neighbouring Ivory Coast and is currently staying in the capital Yamoussoukro. France - the former colonial power - has admitted helping in the evacuation of Mr Compaore. Ivorian leader Alassane Ouattara has said Mr Compaore is welcome to stay as he helped bring peace to Ivory Coast during unrest following elections in 2010. But correspondents say the former Burkinabe president's presence in Ivory Coast has divided public opinion, as some considered that he sided with Mr Ouattara during that crisis. "As a mediator, he helped his Ivorian brothers resume dialogue… That is why, naturally, we welcome him here, following the painful events that shook our neighbour," President Ouattara said after visiting him. "We want the transition to take place in a peaceful and constitutional process. President Compaore will stay in Ivory Coast as long as he wishes." 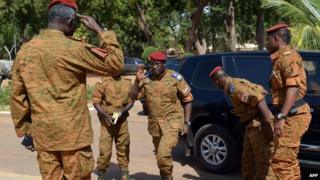 The streets of Ouagadougou were reported calm on Tuesday. The AU's Peace and Security Council is expected to meet again later this month to discuss the crisis, he says. Under Burkina Faso's constitution, the head of the National Assembly should take office if the president resigns. Mr Compaore first seized power in a coup in 1987, and thereafter won four disputed elections. The protests were triggered by his plan to amend the constitution so that he could run for office again in elections next year. Correction 7 November: This story has been amended to make it clear that Col Zida has promised to hand over power, but he has not said he would comply with the two-week deadline set by the African Union.